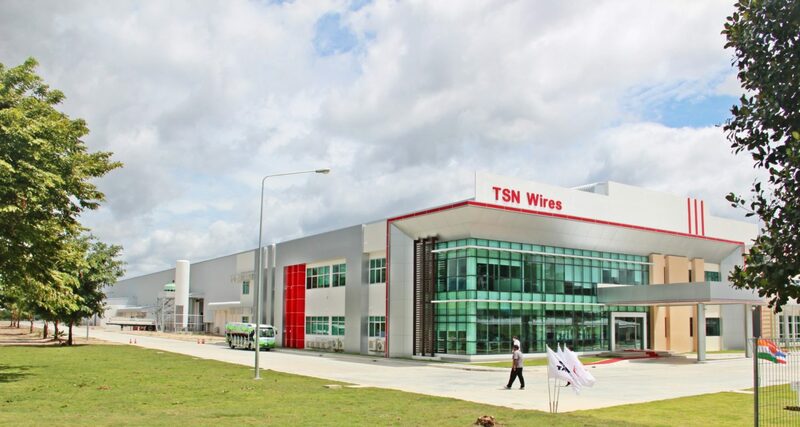 TSN Wires Co., Ltd., a joint venture between The Siam Industrial Wire Co.,Ltd. (SIW) and Nichia Steel Works Ltd.-a direct affiliate of Nippon Steel Corporation, recently held the Foundation Stone Laying Ceremony for its new factory on 35 rai in Hemaraj Rayong Industrial Land. Expected to start operation in July 2013, the new factory will produce zinc-plated wire at a capacity of 36,000 ton per year for supply to local and overseas market. Siam Industrial Wire Co, Thailand a part of Tata Steel’s Global Wires Business has entered into a 60:40 Joint Venture with Nichia Steel Works, Japan to set up a 36,000 MTPA galvanized wires project at the Rayong Industrial Estate in Thailand. The project will make high end galvanized wires including galvanized wires for cable stay strands and ‘Zinc-Aluminium” coated wires. The project will start production in July-August 2013. Nichia Steel Works, Japan is a listed company and an affiliate of Nippon Steel Japan. Nichia Steel Works is a market leader in galvanized wires and wire products in Japan. The Joint Venture agreement to set up a new company “TSN Wire Company Ltd” was signed by Mr Yeoh Choon Kwee MD SIW Thailand and Mr Ichiro Kawamura President Nichia Steel Works Japan on 5th April 2012 at a glittering ceremony at the project site. The signing ceremony was attended by Mr Sunil Bhaskaran EIC Global Wires, Mr Peeyush Gupta President Tata Steel Thailand, Mr Joseph Yong COO, Mr Anirudh Banerjee CFO & Mr James Lau Vice President Legal and Company Secretary from Natsteel Singapore and Mr Kushal Parekh from Tata Steel’s M&A team. Also present was Khun Somchai Palanukroc the Head of the Bankhai District which has been very supportive of this project. The team from Nichia Steel Works was led by Mr Ichiro Kawamura, President, Mr Takeuchi, Consultant & Ex Chairman, Mr Toshio Takama, Director Engineering, Mr Terakawa, Director Sales, Mr Kazuhiro Kanda Chief Engineer and others. The signing ceremony was conducted in English, Thai and Japanese language and followed by an enchanting cultural show by the SIW employees. Mr H M Nerurkar MD Tata Steel conveyed his best wishes,to the Joint Venture. He expressed that this JV would create a formidable alliance bringing in the best of Thai, Japanese and Indian cultures and practices to the project. TSN Wire Co, Ltd will be the latest addition to the Global Wires family of Tata Steel Ltd.